Hand colored in outline engraved map. Shows administrative boundaries, towns, forests, waterways, canals, mountains and landmarks. Includes decorative carouches. Relief shown pictorially. Seventeenth century atlas of the World by Nicholas Visscher. With Engraved allegorical title page, on sheet 51x31, printed in full color, followed by letterpress half title page. 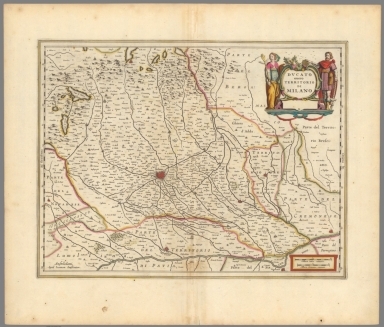 Consists of 127 engraved maps, hand-colored in outline and full, with elegant title cartouche. Visscher is well-known for the depth of accuracy within his maps, and for embellishing the maps' beauty further with small detailing. This work is known for the high quality of engraving, exceptionally fine ornament, and accurate geographical information. His true innovation lies in his rendering of the New World, where he added small variations to the still widely unknown North American coastlines. About 1690 Visscher retouched the old plate of N.J. Visscher, by adding the city of Philadelphia and the name of the state Pennsylvania. Majority of the maps are published by Visscher with additional maps by several other mapmakers. The Atlas Minor is a fine and comprehensive composite atlas, and one of a series of large atlases compiled and sold by the Visscher family of art dealers and cartographers in the 17th century.